Heat oven to 350°. Spray pie plate, 9x1 1/4 inches, with cooking spray. Mash 1 cup of the raspberries, using fork. Stir mashed raspberries, brownie mix, oil and eggs in large bowl until blended. Stir in 1/2 cup whole raspberries. Spread in pie plate. Bake 45 to 50 minutes or until toothpick inserted 2 inches from side of pie plate comes out almost clean. Cool completely, at least 1 hour. Beat whipping cream and sugar in chilled small bowl with electric mixer on high speed until soft peaks form. 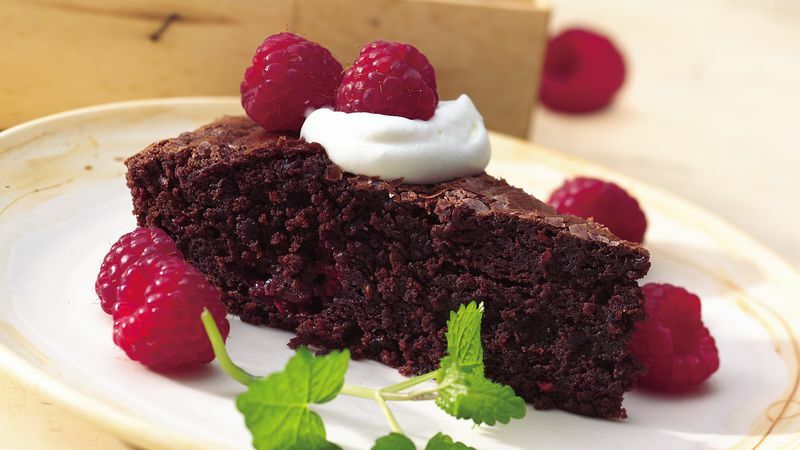 Serve brownie wedges with whipped cream and remaining 1 1/2 cups raspberries. When time is at a premium, omit the whipping cream and sugar and top brownies with frozen (thawed) whipped topping or canned whipped cream topping. Make the brownies ahead and cool completely, then wrap in foil until ready to use. For longer storage, freeze the brownies. Delicious red raspberries work best in this dessert, but if you have golden raspberries, mix them with red raspberries for the garnish.